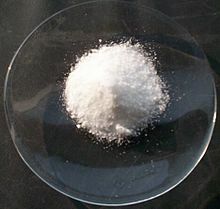 Potassium chloride (KCl) is a metal halide saut componed o potassium an chloride. ↑ "Potassium chloride (PIM 430)". International Programme on Chemical Safety. 3.3.1 Properties of the substance. Retrieved 2011-01-17. ↑ D.B. Sirdeshmukh; L. Sirdeshmukh; K.G. Subhadra. 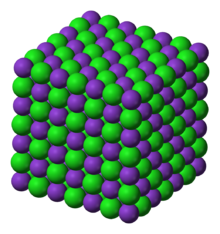 Alkali Halides: A Handbook of Physical Properties. ↑ 3.0 3.1 Zumdahl, Steven S. (2009). Chemical Principles 6th Ed. Houghton Mifflin Company. p. A22. ISBN 0-618-94690-X. ↑ "Compound Summary for CID 4873". Retrieved 17 October 2015. This page wis last eeditit on 2 Mey 2017, at 17:00.